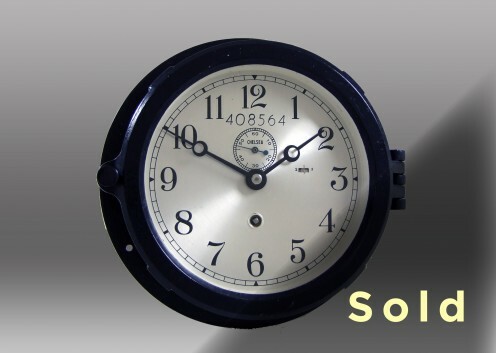 This 6” Marine Mechanical Clock was originally sold to the Federal Shipbuilding Company on January 26, 1944. Housed in a high-impact, black phenolic case with hinged bezel, this silver dial clock features 12-hour time with black numerals and a seconds bit — or “small sweep seconds hand”— directly below the 12 o’clock position. The dial is marked the shipbuilder's serial number, 408564. The 12E movement (time-only mechanism) has been completely overhauled. In addition, new hands have been installed, the case has been cleaned and the bezel glass has been replaced. Serial #408564.